Four audio effect plugins based on Circular Pitch auditory illusion. Is there a better alternative to Endless Series? Is Endless Series really the best app in Audio category? Will Endless Series work good on macOS 10.13.4? 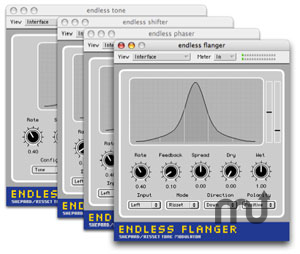 Endless Series is four audio effect plugins based on an auditory illusion known as 'Circular Pitch' or more commonly the 'Shepard Tone/Scale' after Roger N. Shepard who discovered it in the 1960s. Shepard showed that using basic additive synthesis itÕs possible to create the illusion of a continuously rising or descending chromatic scale. The term circular pitch was used because, although the scale sounds as if it is moving in one direction, in fact, after twelve steps it returns to where it started. Note: The downloadable version is 3.10.2. The Mac App Store version is currently 3.2. Endless Series needs a rating. Be the first to rate this app and get the discussion started!